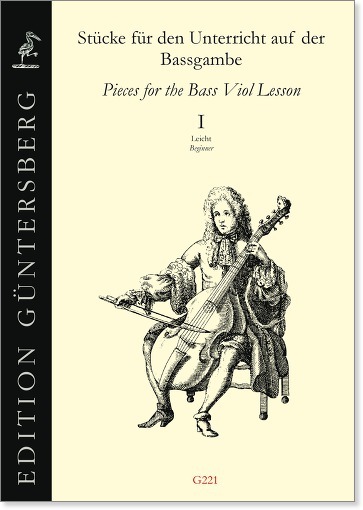 Our editions, which have been prepared by Richard Sutcliffe and Leonore von Zadow-Reichling, aim at presenting a group of works drawn almost entirely from the viola da gamba repertoire which are faithful to the originals and are slowly progressive in difficulty within their respective levels. They are intended to be used by students following lessons with teachers or studying on their own. Every effort has been made to present a wide range of styles and periods. In this way the student gets to know more of the viola da gamba repertoire and can discover where his or her preferences lie. Each volume contains a bibliography which gives information on the source of each piece. The bibliography also lists existing facsimile editions and modern editions in which the piece can be found. Volume I (Beginner): Praetorius, Boismortier, Reinagle, Montanari, Haydn, Senallié, Rousseau, Abel, Ives, Telemann, Schenck and others. Volume II (Intermediate): Boismortier, Harding, East, Abel, Ortiz, Telemann, Locke, Marais, Schenck, Sainte-Colombe and others. Volume III (Advanced): Ruhe, Leclair, Telemann, Bach, Simpson, Couperin, Morel, Schaffrath, Händel, Guignon, Schenck, Caix d’Hervelois, Abel.